Filters are a powerful tool for the data explorer. With a filter, you can easily drill down, consider only the relevant subset, and easily answer even the most complex questions. And when you use custom shapes as filters, they become that much more approachable and user-friendly. Creating custom shapes might sound like a scary notion, but let me be the first one to assure you that they are not. Tableau makes adding custom shapes to your dashboard as easy as downloading an image to your computer and saving it in a particular folder. Really the only tricky part is finding the right folder to save your custom shape image files to. It's called "my Tableau repository." Find image file on the internet. I try to find consistent image formats if I plan to use a set of shapes such as logos or flags. 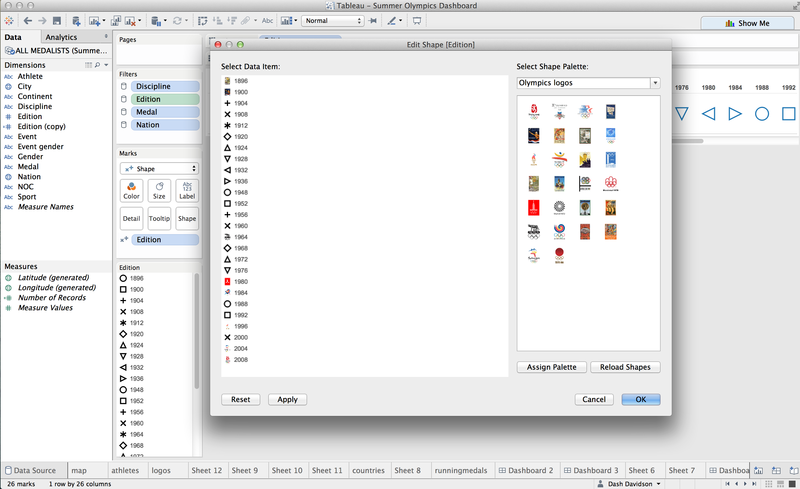 Drag images into your "my Tableau repository" -> "shapes" folder. 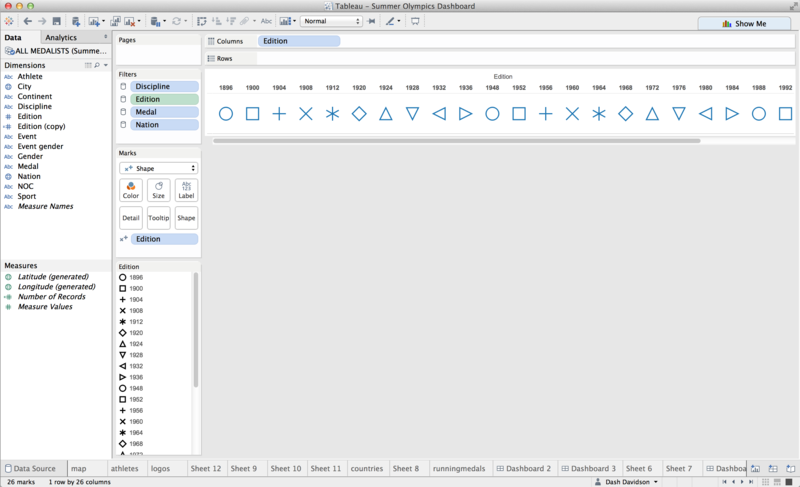 Open Tableau and your new shapes will automatically be included in your "edit shapes" menu. Once custom shapes have been added to a dashboard, you can use them in a visualization in many different ways, some of which are detailed in this Online Help guide. Here, we will focus on just one of these applications, using custom shapes as filters on a dashboard. Custom shape filters can help simplify busy dashboards with multiple charts and views. They provide users an intuitive means of interaction and add a new pictorial element to the dashboard. Let me show what you what I mean. I wanted to visualize all of the Summer Olympics medal winners starting with the first Olympic games in Athens in 1896 all the way up through the 2008 Beijing games. And I decided to use custom shapes as a filter for each Olympic Games in my data set. 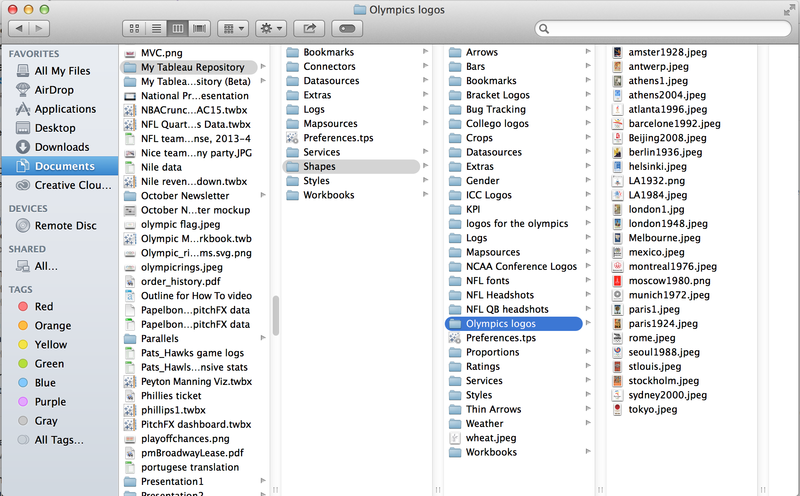 The first thing I did was to find the logos for all the different Olympic Games online and drop them into "my Tableau repository" -> "shapes" -> "Olympics logos" folder I created within the "shapes" folder. I was excited to use the posters/logos for each different Olympic Games as they tell a story in and of themselves: Watch how graphical styles shifted from the Classical facsimiles in the posters of the 1896 to 1948 Games to nouveau minimalism from 1952 to 1980, ending up at abstract expressionism from 1984 to 2008. After finding all of the posters online and saving them in "my Tableau repository," I was ready to start building out my worksheet that would serve as my custom shapes filter. I wanted the posters to be at the top of the dashboard to act as a header for the charts below them. So I created a new worksheet and put the year of the Games field ("edition") on columns. Then I changed the marks card type from "automatic" -> "shapes" and dropped another copy of "edition" onto "shape" in the marks card. I then needed to select my new custom shapes folder and match up the editions of the Games with their respective posters. I clicked on "shape" on the marks card, hit the drop-down "shape palette" menu and switched from "default" to "Olympics logos" and matched up each Games with its poster. Now I had a worksheet with a header column of all my different Olympic Games represented by the Games' official poster. I could now add this sheet to my dashboard and set it as a filter. The result: When a user clicks on a particular poster, the charts on the dashboard filter to only show the data from that particular Games. 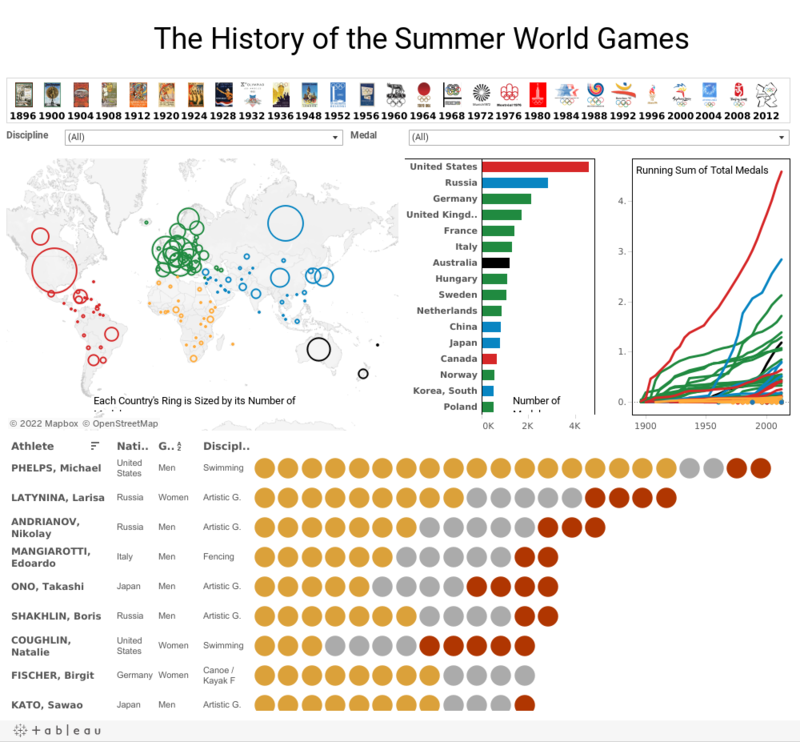 Below is the final version of my Summer Olympics dashboard, showcasing the design and interactive power of using custom shapes as a filter. Clara Siegel's Where Have Dinosaurs Been Found? Are you using custom shapes as filters on your dashboards? Tell us in the comments below. Ah i went to check it out but it's showing 403 forbidden error, I assume you have taken it down now it's a year later? very good article. thank you..
Great write up. Is there any chance you would be willing to share your file with all of the posters?